Over the years, we have manufactured mattress sets with unique sizes and shapes. 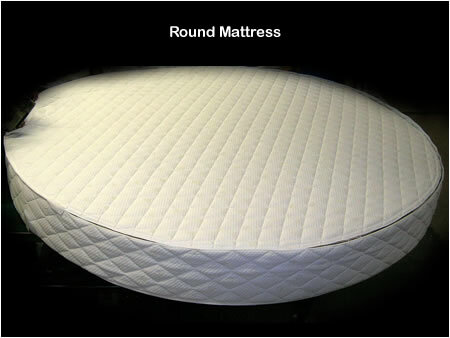 You will see in the photo to the right, a round mattress that we recently completed for a customer. We have made special size bedding for athletes. One interesting order was for a professional ball player for a mattress size 102" long. The standard length for a California King mattress is 84" long! Also, we have made special mattresses for NFL and NBA players. We make mattress sets for historic locations. We had an special order for a mattress set for an antique bed that required the corners of the mattress to be cut out to accommodate the 4 post headboard and footboard. That was definitely a custom order! We also make mattresses for living quarters in horse trailers, campers and motor homes. We had a customer that had a mattress in her camper that had an angled corner. She was so pleased to find that we could make a mattress with an angled corner which perfectly replaced her old one. We have made bedding sets for ball team training camps. If you need bunk bed mattresses, we can make them to the thickness that you would like. They don't have to be thin and uncomfortable! We also make custom height box springs. We had a customer that needed a new mattress set and already had to use a footstool to climb into bed. We suggested that we adjust the thickness of the box springs to help bring the height of the bed down to a comfortable level.